The former capital of India, Kolkata is a case study in contradictions. A city of ironies and contrasts, swanky malls stand just opposite poverty ridden slums and high rise apartments beside dingy old bungalows, cheap street food stalls occupy the sidewalks clashing with upscale restaurants and the traditional Bengali bride takes on a glamorous westernized avatar for her post wedding ceremony reception. So who are the skilled artists in bridal makeup that help the Kolkata bride look her best on her wedding day? 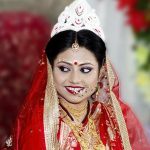 Let’s take a look at the top ten bridal makeup artists in Kolkata who are much sought after to add marital bliss in the city of joy. A well known face in local beauty columns in city newspapers and magazines, Arpita Ganguly has eight years of bridal makeup experience under her belt and has trained under some of the best makeup artists in the country namely Cory Walia, Jawed Habib and others. Her USP lies in bringing out the beauty and character from the most common faces through makeup and blending your look perfectly with your wedding trousseau and the ambience around you. 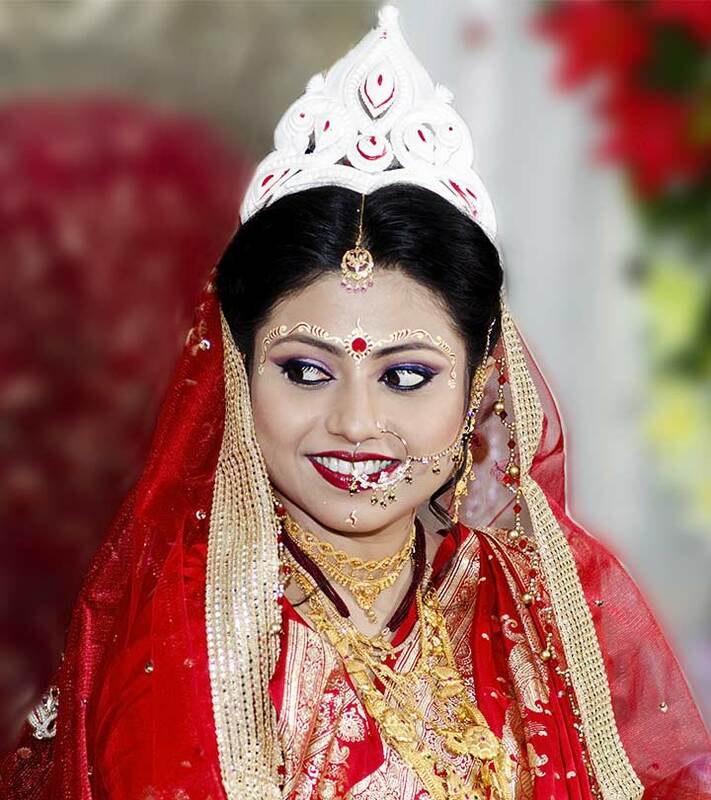 A popular and much sought after bridal makeup artist, Nabin Das is the seasoned stalwart in this field creating waves and much hype in the Kolkata makeup and beauty industry for a long time now. New kid on the block, Jeetu is well known for giving the bride that soft feminine look with lots of peachy and pink shades that are well suited for the coy Bengali bride. Another young makeup expert, Abhijit stresses on the newest international trends in bridal makeup. Not one for too much bling, Abhijit follows the elegant and classy school of makeup and is sure to give you that natural and subtle look on your big day. Assistant to Late makeup maestro Prabir De, Kakoli has now branched out on her own to create a credible identity as a much sought after makeup artist. A notable newbie, Ujjwal Debnath has created quite a name for himself in quite a short span of time as a credible makeup artist. Specializing in both the western and traditional school of bridal makeup, Ujjwal is sure to give you the best of both worlds: the retro look and the new age glam look. Apart from bridal makeup Ujjwal is creating quite a stir in the Kolkata fashion industry. 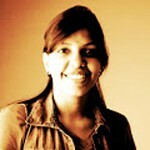 Young and upcoming, Abhijit is the newest face on the bridal makeup and styling scene. Well equipped with sufficient insights into the latest trends in bridal makeup, Abhijit can effectively give you that coy Bengali bride look for your wedding ceremony and the glam newlywed look for your reception. A well known and much sought after artist in the Kolkata bridal makeup field, Bridgette has years of experience and is extremely savvy with all the latest international bridal makeup trends. Another common fixture in local newspapers and magazines for beauty and makeup columns, Bridgette is the cream of Kolkata’s makeup experts. June Tomkins started off as a pharmacist and then gradually veered towards makeup and beauty to create quite a name and a special place for herself amongst Kolkata’s bridal makeup experts. Working out of the June Tomkins salon in Ballgunge Circular Road Kolkata, call well in advance to book an appointment as June is quite sought after and her schedule is quite often packed. Hope you got an idea about the magical makeup artists of Kolkata. We would like to read your views and comments. Please share your feedback with us.